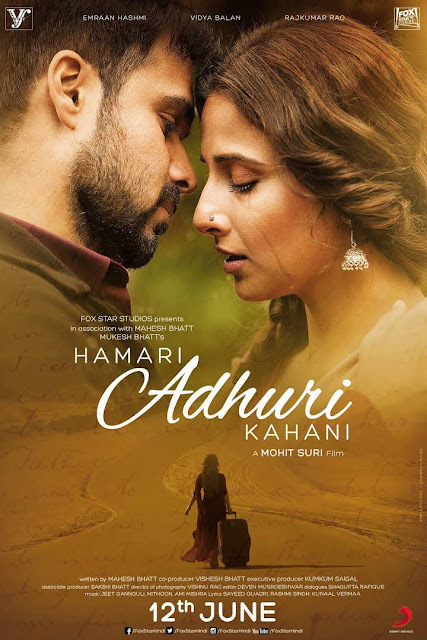 This film should not be called Hamari Adhuri Kahani (HAK). A far more appropriate title would be Hamari Aadhi-Adhuri Khokli Film Ki Kahani. To be fair, Mahesh Bhatt’s story for HAK is not without merit. In particular, the motivations of one character – the terror accused Hari Prasad (played by Rajkummar Rao) – are fascinating, because the extent to which humans will go to get revenge is always worth exploring. It is also worth exploring, as HAK fleetingly does, the motivations of women when they cover their bodies in numerous announcements of their marital status (the mangalsutra/thaali maala, red bangles, sindoor, wedding ring, the works), take on their husband’s surnames and carry babies through nine months of energy-sapping pregnancy only to round it off with painful labour before blithely handing the child over to be named after the father and socially be deemed his heir, not hers. Neither of these is an element to be ignored. Sadly, an outdated storytelling style, a surfeit of cliches, an alarming degree of literalness in its metaphors (especially the references to Radha-Krishna and Sita), some conflicted and laboured ‘feminism’ and terrible dialogue writing end up ruining the potential of this Vidya Balan-Emraan Hashmi-starrer. Bhatt Senior’s basic plotline is interesting, but he fleshes it out poorly. Given the story’s lack of heft, director Mohit Suri’s deliberately languid pace becomes tedious early on. Worse, writer Shagufta Rafique gives HAK some of the most laughably bombastic dialogues to emerge from mainstream, high-end Bollywood in a while. She is clearly aiming for an approach that was popular in 1970s-80s Hindi cinema. Here’s the thing, Shagufta-ji… First, human beings in the real world have never spoken that way, but we were willing to indulge in a collective national suspension of disbelief for a while because it was fun to do so. The fantasy that was enjoyable back then is not so much any more though ’cos we’ve outgrown that era. If you do wish to revisit it, you need the combined panache of writer Rajat Aroraa and director Milan Luthria who pulled it off in Once Upon A Time In Mumbaai (2010) and The Dirty Picture (2011). Mohit and Shagufta, you have delivered some entertaining films together in the past – 2011’s Murder 2, for instance, was neat. But the dialogue-baazi of HAK and its half-hearted direction kill the film. Why does a hard-as-nails, apathetic police officer unexpectedly decide to help Vasudha Prasad (Vidya) escape her husband so that she can be with Aarav? Kyunki yeh kaaynaath bhi sachche pyaar karne waalon ki madad karne ko taiyyaar ho jaata hai (because all of Creation steps up to aid the cause of true love), the gentleman in uniform explains. Why is billionaire Aarav Ruparel (Emraan) so in love with Vasudha? Because bahut saare patey thhey mere, par ghar tumne dilaaya (I had many addresses, but you got me a home), he says. Woven around such lines is the sketchy tale of Vasudha, abandoned by her husband a year after marriage yet clinging – literally – for dear life to her mangalsutra. Why? Because our values are racing through our veins (i.e. nass-nass mein), she says. Sad and pretty Vasudha arranges flowers for a living in a luxury hotel where Aarav arrives as a guest one day. After two meetings, much gazing and some borderline stalking, as floral scents float through the air from Mumbai to Dubai, he develops behad ishq and mohabbat (boundless love) for her. Aarav is a business wizkid with his own dukhi bachpan ki kahaani. He also has a weird reason (Oedipal, though unintentionally so, I suspect) for being drawn to Vasudha: she reminds him of his mother. Combine his back story with her miserable present and a contrived climax involving Bastar, and the result is HAK. Vidya and Emraan have a flair for bombast-by-design as you can see from their track record (he was in Once Upon A Time…, they co-starred in Dirty Picture). Here though they are completely wasted, with little to do but pose around between those hackneyed conversations and speeches. The film has evident pretensions to epic emotions, but extreme close-ups of the leads’ faces, her tears and her curls cannot compensate for a weak story. In fact, Vishnu Rao’s long shots of some attractive locations (an overhead view of Mumbai, a garden in Dubai, the sands of the desert city) get tedious beyond a point in this soulless film. Rao shows little imagination in capturing Bastar, though even his regular shots of a spectacular locale are better than the glaringly fake computer imagery used to conjure up a field of flowers in crucial scenes in rural Chhattisgarh. Suhasini Mulay though gets the worst of the cinematography: when her face is caught in tight close-ups, she looks like a woman possessed by a spirit rather than an elderly relative offering kindly advice to Vasudha. It’s nice to see Amala after so many years in a Hindi film (as Aarav’s mother), but the stand-out member of the supporting cast is Prabal Panjabi (playing Aarav’s employee Apurva) whose inexplicable screen presence gives us one of HAK’s most unwittingly comical scenes: in which he declares his friendship and (platonic?) love for Aarav. As for the film’s seeming ‘liberalism’, the unspirited Vasudha dramatically transforms into a modern-day Durga in a late scene with her husband to articulate some very valid thoughts about a woman’s identity being inextricably linked to her husband’s, but the point is entirely lost in the speechifying, the trite imagery of Durga’s idols passing behind her just then (Vasudha is very conveniently in Kolkata at the time) and the film’s completely contradictory stance until then. No doubt women like Vasudha do exist – there is nothing wrong in portraying this reality. The problem lies in the fact that the film itself seems to endorse the stupidity of such women, going by the symbolism of a naari as a man’s slave appearing repeatedly through the narrative till then: Vasudha cleans her husband’s feet when he turns up at her house after five years, a filthy, bedraggled creep demanding her affection and loyalty; later she falls at Aarav’s feet on discovering that he intends to save that same abusive husband. Then of course there is the not-so-minor point that early on in the film when Vasudha dashes off to save Aarav from a fire in a hotel, he yells at the hotel’s security staff with this spectacularly sexist line: ek aurat ko mujhe bachaana pada! A mere aurat! Imagine that! Spectacularly sexist and spectacularly boring – that’s a lethal combination. It hurts to see Vidya in such a film.